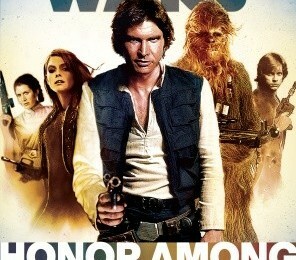 Book Review - Star Wars: Honor Among Thieves - Honk if you love justice! As soon as I heard James S. A. Corey (the Sci-fi pen name for writers Ty Franck and Daniel Abraham) had signed on to write a Star Wars novel, I was all in. Even better was the fact that most SW novels get put on Netgalley so I can read them early review them for you. This is actually the second of three books in the ‘Empire and Rebellion’ series (though they are not interconnected), which has books that follow each of the three primary protagonists of the original trilogy in a new story set during the Rebellion. The first, Razor’s Edge, focused on Princess Leia. Honor Among Thieves is all about Han. The first thing I’d point out is the only thing you need to know about the Star Wars universe to enjoy this book is just the original trilogy. That’s great, as some of the other books are deep into the Expanded Universe nerdery (and much of that may be getting swept aside as Disney tries to make it one big happy universe). This story follows Han and Chewie after the destruction of the first Death Star, as they try and reconcile being scoundrels who dislike any and all governments with working for the Rebels, whose stated goal is to replace the Empire with a new Republic. I really enjoyed Han’s internal struggle – he likes and trusts Leia and Luke, but doesn’t (yet) want to join the team. This plays well against the new hero we meet in Scarlet Hark. Han and Chewie go on a simple mission to extract the Rebel spy, but thing don’t go exactly according to plan. But hey, do they ever? What it kicks off is a race between the Rebels and the Empire for a long-lost superweapon that adds a very Indiana Jones feel to the Star Wars universe. The use of Leia and Scarlet as a choice between the independent life of a smuggler and the legitimate government agent works well to build the character of Han into the man we know later in Return of the Jedi as well as in Zahn’s books. If I had any complaints – and they’d be very minor – it’s that the plot contrivance of a superweapon created by a long-lost race seems a bit played, but it didn’t take my enjoyment away at all from the rest. There’s a few EU lore bits that stuck out as being off, such as a Noghri appearing (and Han knowing what it was) but again, doesn’t cause a problem for the story. I highly recommend this book to anyone who has an interest in what happened during the Rebel years, or who enjoys Corey’s Expanse series. Honor Among Thieves will be on sale 3/4.